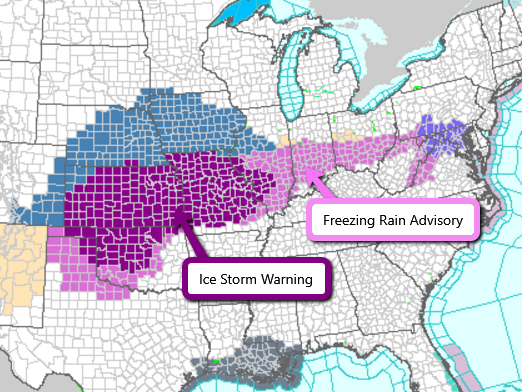 An ongoing ice storm across parts of the Central U.S. has already created hazardous roads and multiple accidents from the Texas/Oklahoma panhandles into Missouri. Some spots in Missouri have already picked up nearly three quarters of an inch of ice! Kory Hartman spotted this rollover accident in Jonesburg, MO earlier today. Surface temperatures in the area hovered around 27F as rain fell and instantly froze to cars, signs, and roads. Conditions are expected to deteriorate further over the next 24 hours as more ice accumulates. Roadways will continue to be slick. There could also be power outages and downed trees due to the weight of the ice. Follow us on Twitter and like our Facebook page for the very latest information.